FOR WRITERS BY WRITERS is a dialogue of many voices to establish the essence of the art of literary writing. Renowned writers of world literature give their views point on the art of writing. Each voice is articulated in a continuous discourse, led by the author, as if it was said by a single narrator. 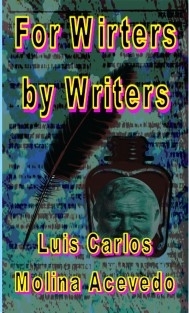 For Writers by Writers is presented as a practical guide for the new writer. From the experience of established writers, they are given advice to enter this fascinating world of literature. Each recommendation for experts and non-experts, will allow them to become good writers, and if they dont reach this, at least they become good readers. Then, they fully enjoy their readings, because now they read like writers.